We were so pleased to see this blog post from @SlackHQ this morning that we felt it warranted not only a blog post, but a special place as our first blog post. In the coming weeks and months we will use this forum to discuss various digital marketing topics focused primarily on how marketers can better leverage data and analytics using collaborative tools (or as Mary Meeker calls them “enterprise messaging threads”) like Slack and MS Teams. Every startup has an origin story and most stories start with a desire to solve a problem that has an elusive and intangible solution. You’ve become convinced that the problem is real and are willing to embark on a journey down a twisted and winding road you hope ends with an answer. It seems obvious now, but it took a long time to understand that data alone was insufficient to change behavior. What were we missing? There was clearly a problem, the solution was elusive but by this time we had grown convinced that this problem was worth solving. There was a road leading somewhere, hopefully to a solution, and we decided to follow it. Two roads diverged in a wood… one led to a dashboard and the other led to a team. Breaking News: MarTech is fragmented. The hardest part of our journey so far was navigating an increasingly fragmented MarTech landscape. 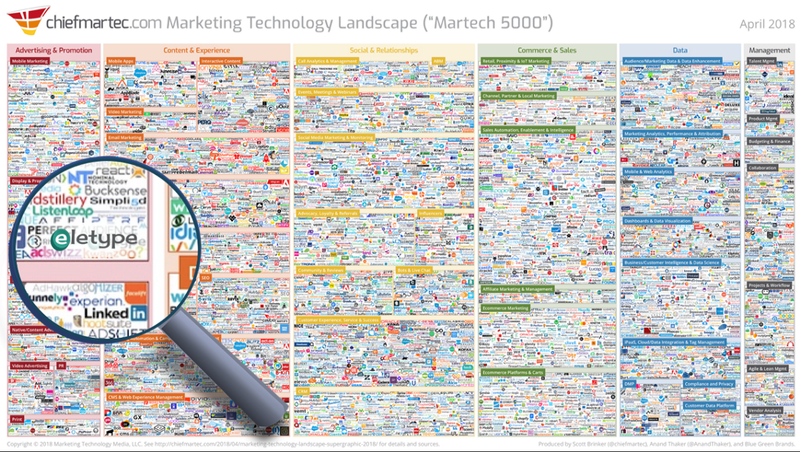 Just check out the latest MarTech 5000 super graphic here. If you look real hard you can see Eletype (took me a while to find us too). We learned very early on that if we were going to differentiate we were going to have to do it in a manner that decreased, not increased, fragmentation. How do you stand out in this mess?? We went out and interviewed over 100 marketing experts and the thing we heard, time and time again, was that Slack was the one tool that actually made their teams more efficient and more productive. You know what didn’t make teams happy? Logging into another tool and viewing another dashboard. Yet here we were showing them another tool with another dashboard. What to do? So that’s when it hit us. If we were going to help marketing teams, we were going to have to become part of the team. So we went where the teams were and that was in Slack. Two roads diverged in a wood and we chose the one where the teams were happy. We decided right then and there to release our product exclusively as a Slack App. Was this the right approach? Well, that is to be determined, but early success seems to indicate we are on to something and we are absolutely thrilled to see validation in our approach not only with early customers, but from Slack too. Delivering a consistent and connected customer experience is what’s expected of today’s marketing teams. To do so, specialized teams within marketing must coordinate across functions (e.g., social media, email, website, product, brand), but this only gets harder when you consider that each team might use different tools and have distinct communication preferences and processes. We are building Eletype to cut across functions and bring teams together across the enterprise. Marketing isn’t an island any more. 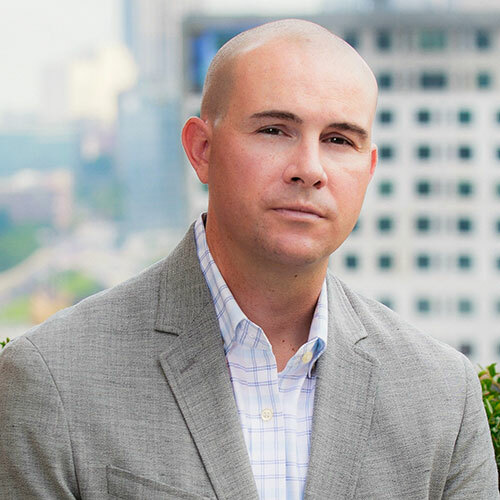 Today’s marketing team needs to collaborate and coordinate with the web team, the IT team, the sales team, and increasingly directly with the executive team. The majority of polled professionals said lack of alignment and collaboration between sales and marketing leads to weaker financial performance (60%), poorer customer experience (59%), and reduced customer retention (58%). 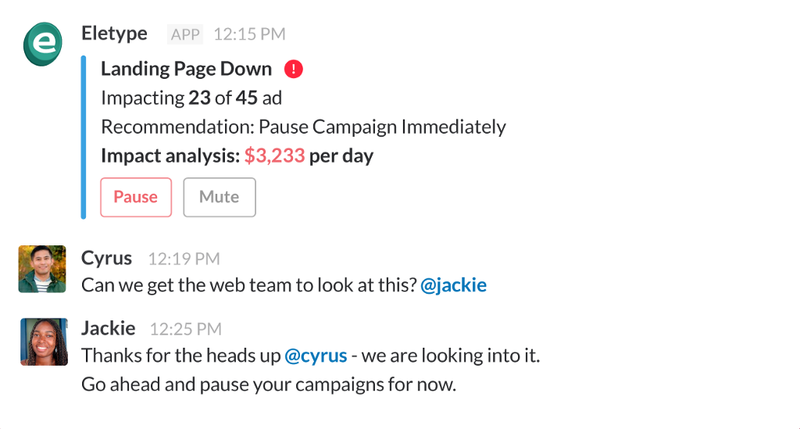 Marketing teams using Slack execute campaigns 16% faster and spend 8% less time getting them launched. Now that’s what we call validation. We’ve got many more posts queued up and we look forward to building marketing technology that increases collaboration and coordination and decreased fragmentation. 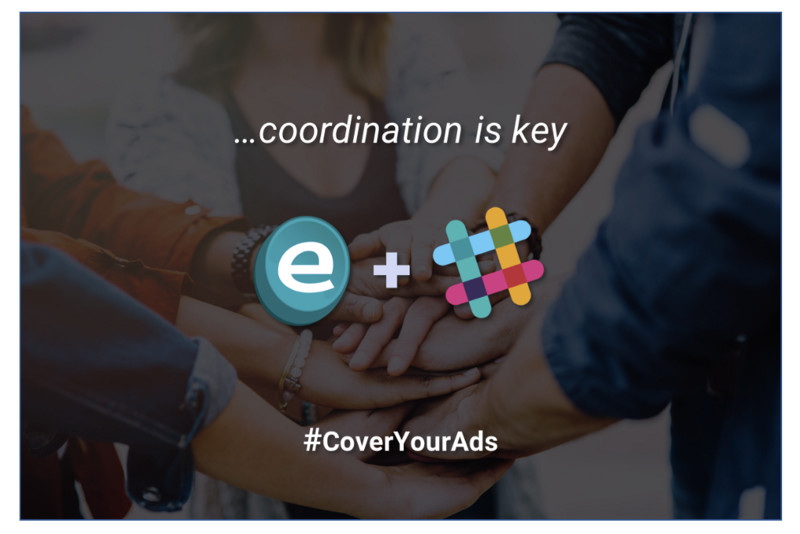 Validation on Collaboration was originally published in Cover Your Ads on Medium, where people are continuing the conversation by highlighting and responding to this story.